It’s not very common to see a Boeing 747-400 operating domestic flights within the US — especially on flights to Seattle. However, on January 1, 2017, Delta is doing just that, with a one-off flight from Minneapolis (MSP), as TPG reader Aris S. shared today. The flight, Delta 2221, will depart MSP at 11:19am and arrive in Seattle at 12:55pm. January 1 is a peak travel day (which may explain the extra capacity), and fares are already quite high — you’ll pay $756 for first class or $534 for economy. One-way award seats are available for 32,500 miles in economy or 55,000 miles in business, which is steep. If you’ll be going out of your way to travel on this one-time 747 flight, you’ll probably want to grab a seat in first class. 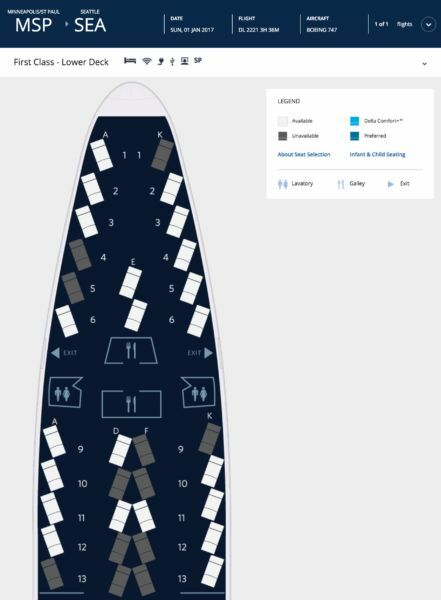 These flat-bed seats are typically sold as Delta One on international flights, and are arranged in a 1-1 configuration on the upper deck and in most of the forward cabin, and a 1-2-1 configuration behind Door 1. Oddly, there doesn’t appear to be 747 service available in the other direction — it’s not clear where this plane is headed next, but as of now it’s not assigned to any of the day’s Seattle-Minneapolis flights. The flight’s filling up pretty quickly, so if you think you’ll want to fly, be sure to grab a seat sooner than later. Are you traveling on Delta’s one-off 747 flight to Seattle?